The top ten questions that people asked about using limestone and marble in their self build projects. Over the years that we've been exhibiting at the Home Building Shows, we've been asked a wide variety of questions about using natural stone and particularly limestone but a few come up more frequently. Here are the most commonly asked ones. 1) Do limestone tiles work with underfloor heating? This was this year's most commonly asked question. It shows the rise in the trend for using underfloor heating whether it's an electric or a wet system. Many modern homes are built with only underfloor heating and no longer use radiators. All types of natural stone flooring work very well with underfloor heating. There are some things to consider, such as using anti-fracture (or de-coupling) matting to prevent cracks caused by thermal expansion. This is the case whether you use stone or ceramic or porcelain tiles. We can advise on how the substrate should be prepared to maximise efficiency and minimise running costs. 2) Can you use limestone tiles outside? Inside/outside living is another growing trend. Many of our visitors had architect plans featuring large glass doors leading out to terrace areas with the same flooring running from inside to outside. 3) How easy is it to maintain limestone flooring? Many people that asked this question said they lived in the country and had dogs and/or children. It's a good question and it has an easy answer. The key thing is to seal the flooring correctly during installation and we can advise on how this should be done. The ongoing maintenance is then low, simply mop the tiles with a PH neutral detergent. The frequency for resealing depends on the amount of traffic the area receives and the cleaning regime but is usually only every few years. Specialist cleaners are available for any spot or stubborn stains. One advantage is that the grout is also sealed during the process and, as many porcelain tiles should be sealed to prevent staining, the process isn't unique to natural stone. Click here for further information on sealing and maintenance. If you have an existing stone floor in need of cleaning or restoration, we can put you in touch with specialists who can help. 4) Will a stone floor feel cold underfoot? Many people's experience of stone flooring is on holiday abroad and they ask if it will feel cold when used in our cooler climate. On a hot summer's day, a tiled floor will feel beautifully cool to walk on but on a cold winter's evening, you want a floor that feels warm and inviting. In this respect, natural stone is no different to any other hard floor covering. The answer is to incorporate underfloor heating into the design and it works really well with natural stone. 5) What size do limestone tiles come in? Customers who buy "off the shelf" products are used to the idea of being limited to whatever size is in stock. We source stone specifically for the project so it's more a question of what size you would like or what best suits your room size and style. There are constraints such as the maximum block size the quarries can handle and their factory processing capability but this does not normally restrict the choice of domestic tile size. The constraint is more likely to come from the practicalities of installation or the budget. Most of the quarries we work with will cut the tiles to whatever size is requested. So, you can have pretty much whatever size you want. We're happy to advise on tile size and layout - just send us your project plans. 6) Is natural stone sustainable? This has become an increasingly more important question for architects. Natural stone is one of the most sustainable building materials. It is long-lasting, requires no heat or chemicals to manufacture, can be recycled if/when it reaches the end of its useful life and has no damaging impact on the environment when disposed of. Quarries can be returned to nature when they are no longer economically viable. Amarestone was recently assessed by an independent consultancy which confirmed that we and the quarries in our supply chain operate sustainably and ethically. 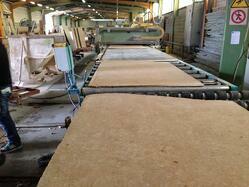 Here's a link to a useful article that explains more about sustainable stone. 7) Can you use marble and limestone in bathrooms? The reason behind this question is usually that the customer is aware that limestones and marbles are porous. The answer to the question is definitely, yes, you can use stone in bathrooms. Marble (or hard, polishable limestone) is the preferred choice for many high end bathrooms and is seen in top class hotels and private residences all over the world. The surface of the stone should be sealed with a good quality sealer to minimise the maintenance. As with any tiled bathroom, the key to a long-lasting solution is to ensure that the walls and floor are stable and fully waterproofed or tanked before the tiles are installed. 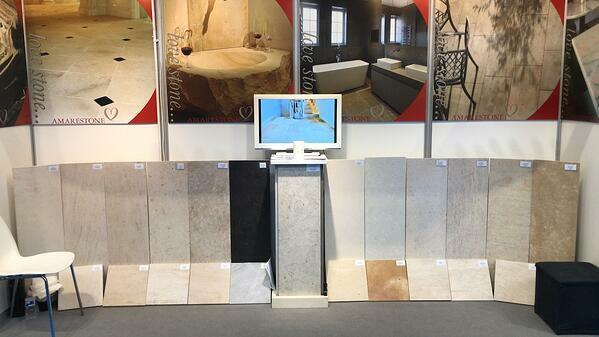 There are several articles on our blog pages that explain more about natural stone in bathrooms. 8) Do you have a catalogue? We're often asked if we have a catalogue or if all the available choices of stone are shown on our website. The simple answer is no. We have a downloadable brochure but it is just a general guide to what we offer rather than a list of products that we supply. This is because we have access to such a huge selection of stone, from a wide range of quarries across Europe. Each stone type is available in a large selection of sizes and surface finishes and the range is constantly being added to or updated so it would be impossible for us to show all the choices available to you. You may already know the type of stone (or even the exact stone) that you want to use but if you don't, where do you start? Firstly, have a browse of our website. 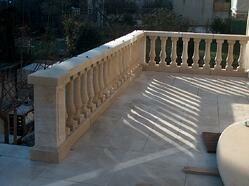 We particularly specialise in French limestone and most of the stones we deal with are described in detail there. There is also a gallery of images of completed projects to help give you some ideas and you can download our brochure. Then just send us an email or call with details of your project. We'll be happy to discuss the options with you and arrange for you to see some samples. Let us know if you have seen a stone you like for sale or installed elsewhere. We may be able to identify the stone and provide you with a quote or suggest a suitable alternative. Photos are always helpful of course. 9) Which is better, marble or limestone? We are sometimes asked what is the difference between marble and limestone, which is better and is one more expensive than the other. Limestone is defined as a sedimentary rock predominantly composed of calcium carbonate. Marble is defined as a metamorphic rock which has been subjected to very high temperatures and pressures resulting in a crystalline structure. One isn't inherently 'better' than the other. The technical properties of the proposed stone should be checked against the project requirements. This is where the CE certificate is so useful. It lists out the test results for the stone and helps the specifier to determine whether or not a particular stone is fit for purpose. The range of prices overlap with some marbles being cheaper than some limestones. It just depends on the particular material chosen. 10) What happens if I spill red wine on my new limestone floor? This has always been a popular question whenever we exhibit at the homebuilding shows. Red wine and turmeric are widely perceived to be the villains and the potential ruin of natural stone floors. If you have any other questions or need expert help with your natural stone project, please call us on 0345 260 80 70 or email steve@amarestone.com.